In the Rolling Your Own JavaFX "Custom Nodes": A Graphical Menu Example post, I began showing you how to create your own UI controls in JavaFX. I also said that the JFX Custom Nodes category has been started in this blog in which custom nodes that you and I create will be featured. By the way, Malden Labs, under CTO Thom Theriault's technical leadership, has made a strong commitment to using JavaFX for some pretty exciting systems in the works. Anyway, if you would like to try today's example out, click on this Java Web Start link, keeping in mind that you'll need at least JRE 5. Also, installing Java SE 6 update 10 will give you faster deployment time. *  A node that shows a deck of nodes one at a time. *  the id attribute of each Node must be assigned a unique name. * A sequence that contains the Node instances in this "deck"
* enable the fade-in effect. 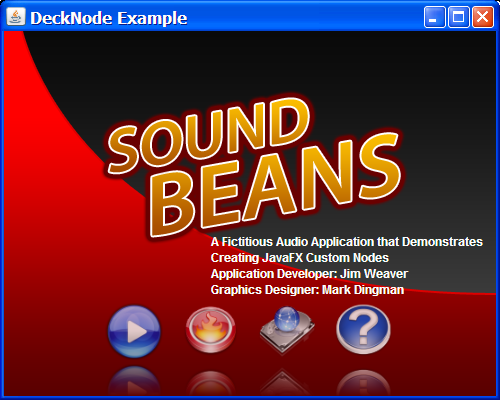 content: "A Fictitious Audio Application that Demonstrates"
content: "Creating JavaFX Custom Nodes"
content: "Application Developer: Jim Weaver"
content: "Graphics Designer: Mark Dingman"
Please notice the last line of the listing above is what causes the node that we named "Splash" to be displayed when the application starts. 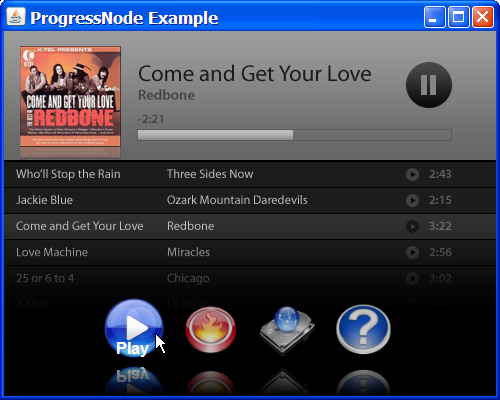 The code for the other custom nodes used in this program (ButtonNode.fx and MenuNode.fx) are in the Rolling Your Own JavaFX "Custom Nodes": A Graphical Menu Example post, so you may want to visit that post. At some point I'll put these custom nodes in a JAR file if developers find them useful. As always, please leave a comment if you have any questions of comments! great screencast, thanks very much! !